*Some dates are subject to change. Please check back for updates. Part of our 30 year old catalog of songs has been preserved on digital format, remixed and uploaded on their website for licensing in advertising, TV, radio, movies, etc...check it out, and also like "In the Groove" on Facebook! 22 songs from Changing Minds, Blind Impulse, Stickman EP, and Stickman 12" on one CD! "Echo Return" is a collection of 9 previously unreleased newly-recorded PHONES songs plus new versions of crowd favorites "Take your Time" and "Shake That Trance". This recording finally captures what gained them such a loyal following and a reputation for sizzling live shows - all the power and energy combined with tightly woven vocal harmonies and unforgettable songs. From the opening build of "Take Your Time" Echo Return exhibits a wide range of styles- surfadelic grooves, trippy Middle-Eastern influences, electro-punk - but somehow always manages to sound unmistakably Phones. Echo Return available now at Electric Fetus, Let it Be Records, Cheapo Records and other fine stores. If it's not on the shelf yet, ask the store to order some copies through Electric Fetus Distribution, or get it direct off the web site order form. Buy one for yourself, and one for a friend! Visit the Echo Return page for MP3 and RealAudio samples. 4 SONG SAMPLER CD - QUANTITIES ARE EXTREMELY LIMITED. GET YOURS NOW! AVAILABLE FOR $5 EACH. FAB GEAR from the PHONES - Retro Dial T-Shirts and more!!!!!!!! 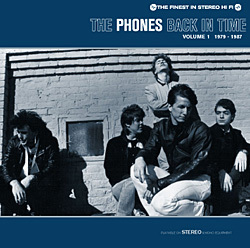 Forming in 1979, the Phones released their first single "I'm So neat" b/w "She Said Goodbye in February of 1980 on their own label, Phone-O-Graph Records. A second single, "Suspended Animation" b/w "Kids Today" was released a year later. In the Spring of 1981 the group recorded their first LP. The album, "Changing Minds" was picked up and released by Twin Tone Records in March of 1982 where it became one of their biggest sellers to date. In 1983 they began work on their second Twin Tone record "Blind Impulse" which was released in early 1984 to rave reviews including one from Robert Palmer of the New York Times who called it, "Sheer Stylistic Originality" and gave it "Top Honors, this is a band to watch." 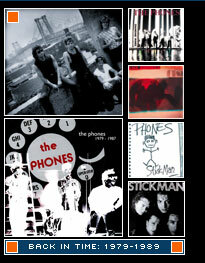 1986 the Phones released the "Stickman" EP on newly formed Pendulum Records. This fierce collection of songs received a large amount of airplay on FM, and College radio. A change of instuments, and 1 new member led to a name change for the band in 1987 and release of the self titled "Stickman" 12" single featuring "Crawl Walk Run" b/w "She Goes Round". This record too was played extensively by radio stations across the country, and received favorable mention in Billboard Magazine. 1989 the band released their swan song cassette titled "Stickman Live" (the way it should be) A collection of two of their last live performances captured onto 8 tracks, and released on Pendulum Records. This limited edition tape soon sold out, as the band faded from the Minneapolis music scene in the fall of 1989. A few years later, in 1992 a request from a good friend brought the Phones back together again to help raise money for his sons cancer treatments. Soon the Uptown fire that brought down the corner of Hennepin and Lake, had them gigging again, this time to raise money for the occupants of the upstairs apartments, one of whom was Phones former soundman Mike Youngman, as the fire consumed everything of his, including Mikes extensive recording library of Phones live shows, basement jams, and half baked song ideas. These shows led to at least 1 benefit, or "just for the hell of it" reunion shows per year for the next few years. Requests for re-issues of the old albums kept pouring in, as did requests for re-mastering the albums to that new fangled format called "Compact Disc"
The band decided to check on the possibility of making the old records available on CD in late 1998. That plan evolved instead into releasing a collection of completely different songs. Songs never recorded before. Pre-production started in January 1999. The Phones went into the studio in June of 1999 and came out at the end of August. The result is 10 previously unreleased songs, and 1 updated recording of "Take your Time". (originally released on the Phones "Stickman EP" 1986) All songs were written by the Phones between 1984-1988, including some co-written by former guitarist Rick Taves (R.T.).